Sports organizations looking for new ways to drive awareness in high-traffic destinations should take a close look at some recent partnerships between The Parking Spot and a number of notable sports properties. The Parking Spot, the nation's leading near-airport parking company, devised a terrific strategy to align with some of the country's finest athletic departments to wrap their airport shuttles with the colors, logos, and flair of competing schools in specific markets. In 2009, the Parking Spot added the University of Texas and their biggest in-state rivals, Texas A&M University (a rivalry that dates back 115+ years). 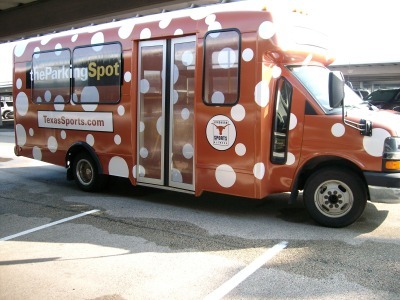 The Parking Spot wrapped six (6) total shuttles in operation at three of Texas' largest airports (Houston, DFW, Austin) with logos, verbiage, and the athletic department's official website. The shuttle operator even allowed the University of Texas to add temporary peel off banners that incorporated their national championship logo prior to their appearance in the 2010 BCS National Championship. Inside the shuttles, travelers are provided a chance to see recent highlights on flat screen monitors, season ticket information, updates about future events, and related University messages. The partnership is significant because it provides the Universities with increased brand exposure in high-traffic destinations while The Parking Spot benefits from travelers recognizing and preferring their airport service due to the company's affiliation with their favorite University. Founded in 2008, The Parking Spot now operates 18 locations serving 12 major airports (4 of which are situated in the state of Texas). 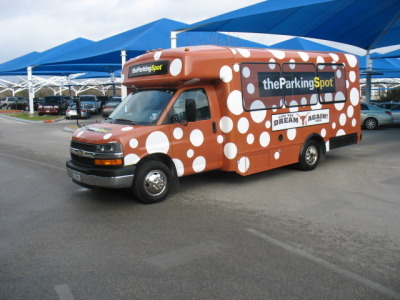 The Parking Spot is partnering with a number of other sports properties, including: USC, UCLA, TCU, Kansas, Georgia Tech, Arizona State, Central Florida, Saint Louis University, the Los Angeles Kings, the St. Louis Blues, and the Houston Aeros. A special thanks to Jake Baskin of the Longhorn Sports Network (IMG College) for his insights and contributions to this column.